Australia’s banned cricketers Steve Smith and David Warner have been drafted to play in the Global T20 Canada event, which gets underway later this month. Steve Smith and David Warner to play in Global T20 in Canada By Tejas Kotecha Last Updated: 04/06/18 7:50am David Warner and Steve Smith will be playing cricket in Canada this month Australia’s banned cricketers Steve Smith and David Warner have been drafted to play in the Global T20 Canada event, which gets underway later this month. 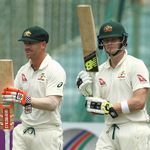 Former Australia captain Smith and vice-captain Warner were given 12-month bans by Cricket Australia for their role in the ball-tampering scandal in the third Test against South Africa in March. Warner was selected in the third round of the draft by the Winnipeg Hawks, who also have West Indies’ Dwayne Bravo and South African David Miller. Smith was taken in the second round by the Toronto Nationals, where he will play alongside West Indies duo Darren Sammy and Kieron Pollard. It runs from June 28th to July 15th at Maple Leafe Cricket Club near Toronto.